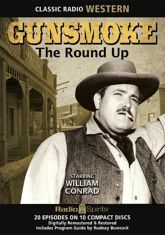 The creak of leather, the rattle of spurs, the dry wind whistling along the dusty streets of Dodge City -- that's the world of Marshal Matt Dillon (played by William Conrad). Join him for twenty journeys into the West, with Parley Baer as Chester, Howard MacNear as Doc, and Georgia Ellis as Kitty. In the wildness of the territories, greed lurks behind the grin of a gambler, vulnerable families meet their fates, and range wars are brewing. Outsiders come to town to start over, to start some trouble, or to die.